Occasionally boaters find that even though they’ve tightened the bolts on the Molded Oar Sleeves or Oar Rights on their oars as far as they’ll go, the parts aren’t tight enough and they slip. With an Oar Sleeve, there are a couple of things you can do to correct this. One is pretty simple; however, it may have to be redone occasionally. The other is more permanent, but requires more work. 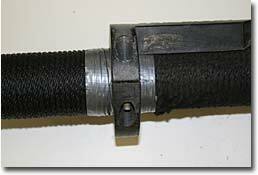 The simple fix is to “shim” out the oar shaft so that the place where the Oar Sleeve cinches down has a larger diameter. Do-it-yourself boaters usually choose one of two shim materials – sandpaper or that grand fix-it elixir…duct tape. Sandpaper works well because the rough surface is grippy. Cut a strip and wrap it around the oar shaft, grit side out. Secure it with a bit of tape or a spot of glue. Wet/dry sandpaper will make a more permanent shim. Slide the Oar Sleeve back in place, tighten it up and you should be good to go. You can do the same thing with duct tape. Use a good quality tape and wrap it around the shaft to the right thickness. The more permanent fix is to use a file or rasp to remove some material from the faces of the gap, widening it so you can cinch the sleeve tighter. The Sleeve’s plastic is pretty dense, so use a coarse file and patience in removing material. 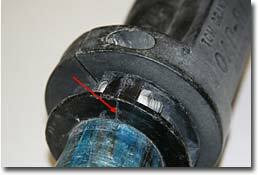 The area where the Oar Right is placed has been worn down in the oarlock so thin that the Right still slips when fully tightened. You’re less likely to have an issue with the Oar Right slipping on the Oar Sleeve. If you do, you can use the shim method. However, since the Oar Right breaks into two pieces, it’s easy to sand or grind off some excess material from the meeting faces. When using rope wrapped oars, many boaters use either plastic stoppers or rubber ones and control the blade angle with their wrists. Some prefer to have the angle fixed by using an Oar Right. The Convertible Oar Right is a good choice for these boaters. With the spline folded up out of the way, they get the rope wrap advantage of being quiet and smooth in the oarlock. Then, if they get into a situation where every oar stroke counts, they can lower the spline and get the positive blade action of the conventional Oar Right. The issue you can run into with this is the rope wrap may not give sufficient diameter to the oar shaft to allow the Oar Right to tighten properly. 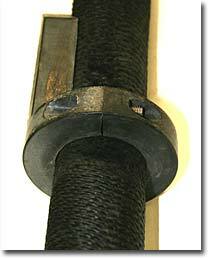 The rope used may be too thin or may have become compressed by wear from the oarlock. The solution once again is to shim out the area to the right diameter. The easiest thing to use is our old friend, duct tape. You can also cut strips of thin rubber, like that of an inner tube and wrap it around the area. Sandpaper, duct tape, files, an inner tube…easy stuff to get and use. Like most do-it-yourself projects you as a boater may run into, it’s not “rocket science.” So, roll up your sleeves and get into the Joys of Fixing Your Own Gear.